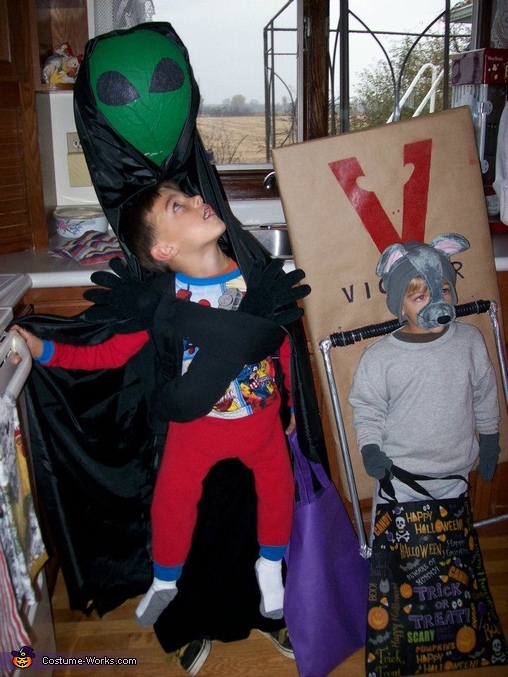 Alien Abduction: I used a balloon and paper mache for the alien's head. I then painted it green and glued on some eyes made of black felt. The alien's "body" is an old backpack. I used an old broom handle to attach the head to, then I put the handle inside the back pack. 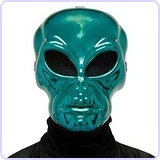 (You'll have to cut the broom handle) The alien's head should be about 2" above your child's head. I put a black turtleneck on the alien and stuffed his arms with fiberfill. I then stuffed some gloves and pinned them to the arms. 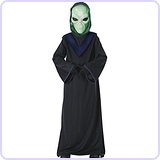 I used some lightweight black fabric for the alien's cape, and attached velcro to the head, then the alien's "hood". 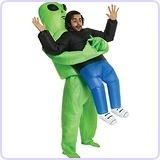 Also use velcro to attach alien's hands to the child's body to make it look like the alien is holding him. For the pajamas legs, make sure they are a few sizes smaller than your child so that he won't trip on the "legs". I stuffed the legs with fiberfill, and pinned some stuffed socks for the feet. Then I pinned the pajama bottoms to the pajama top. When the child puts on the pajama top, the legs are attached and hang over to create the illusion that he is being carried by the alien. Mouse Trap: The trap itself was made from a foam insulation board, re-inforced with cardboard. Then I wrapped it in brown packing paper. I created a stencil for the "Victor" logo and spray-painted it red. I cut the straps off an old back pack and threaded them through the insulation board so that the child could wear it like a back pack. I hid the straps by cutting holes in the sweatshirt and threading the straps through. PVC pipes and corners, and some chrome-colored duct tape made the "trap" part. I used some old television cable to make a "spring" around the top of the trap part. This was attached to the insulation board using cable ties threaded through to the back of the board. We got tons of compliments on the costumes. I'm already trying to come up with something to out-do them for next Halloween!